Proof God exists? Not quite, but we’re close. 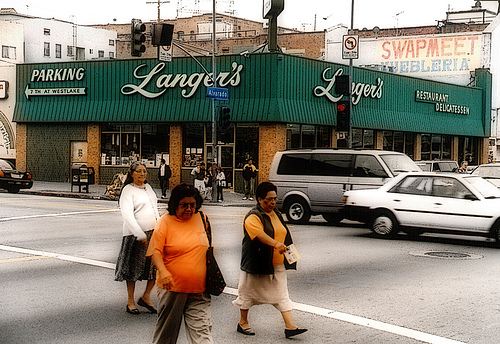 Langer’s Deli at the corner of Alvarado and 7th in MacArthur Park perfected pastrami. Hands down, the best in Los Angeles. However, Gourmet Magazine ranked it at a mere #2. My colleague and I discussed its rating over lunch and we can’t even make up something that is totally absurd that would make it better. If it was served by a naked Jessica Alba with an Iggy Popp waiter it would still carry the same prowess of Earth’s Mightiest Sandwich. It’s like the realization of the Rosetta Stone, invention of the tin can, and discovery of Santo Domingue all-in-one. It is the finest achievement of Western Civilization. Christmas and the fork bow to the Pastrami at Langer’s. And then there is the perfectly frosted mugs that make a Bud Light to a Langer’s Pastrami sandwich what the Roosevelt Corollary To The Monroe Doctrine is to the Monroe Doctrine. But seriously, the rye bread tastes like it is made from the Emperor’s private grain stash, the Cole Slaw oozes with a Russian Dressing that Rasputin used to revive himself time-and-time again, the Swiss Cheese tastes like the Alps look, and the Pastrami is prepared like a Blitzkrieg. Except it loves Jews. And I love it. 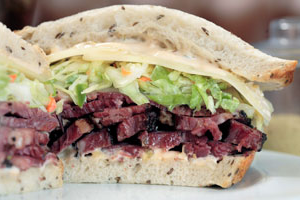 I’m going to seek out this #1 deli in L.A. and I guess lose weight eating it because that’s the only thing that could make it better. And then I’ll ride a unicorn over to God’s House and hurl Iraqi WMDs down at Langer’s in sole allegiance to #1.